Want to try your own Clean Program? Use code "austinclean" for $60 off until June 15th. Today I’m sharing my experience with the Clean Program 21 Day Fix. Over the past 21 days, I’ve experienced a number of emotional, physical and mental changes. To give you some background, this program consists of cutting out all processed foods and sugar, removing most grains, detoxing from caffeine and implementing two smoothies a day. You stick to a strict list of foods mostly consisting of veggies, protein and greens while also drinking a smoothie in the morning and a smoothie in the evening to help with digestion. You also take multiple vitamins and probiotics to encourage the cleansing process and drink lots of water. Not the easiest of cleanses, even for those who eat pretty healthy already. Let me start by saying, I believe that food has such a power over people and also believe it has played a major role in my happiness, and my sadness, over the years. I used to have a major food obsession because I was trying to control every aspect of my life, especially my weight. Over the past year, I’ve used intuitive eating and listening to my body as two ways to improve my overall health (you can learn more about my health journey HERE). Even though I eat extremely healthy and as clean as possible, I still have a very sensitive stomach. I have always had stomach cramping, bloating and digestive issues that a doctor hasn’t been able to explain to me. I’ve tried allergy tests, I’ve seen multiple GI doctors and have even claimed to be gluten free because I thought that would help. NOTHING HELPED. I decided to try out this program because what did I have to lose? It’s a program that encourages wholesome foods, clean eating and being kind to your body through foods and vitamins. It seemed simple and heard incredible reviews from people on improvements in their symptoms after using this cleanse to pinpoint the problem foods. This 21 day program has been a roller coaster for sure. I never knew how attached I was to food and the feeling that cooking and eating brought me until my body started showing symptoms I hadn’t experienced before. Within the first couple of days, I had sugar withdrawals, a major energy dip and struggled with jealousy of not being able to chew food at night while James was eating his dinner. I think each week of this program brought a different range of experiences so I thought I’d break it down into each week and share my experience. Week 1: The first couple of days weren’t too bad. My body hadn’t fully understood what was taking place, therefore, it felt pretty normal. Around day 4 I noticed my energy slowing down a bit and noticed my smoothies tasting bland. I definitely need to come up with some creative ways to build out thicker, fuller and more nutrient-rich smoothies to keep me full for longer. My morning smoothies mostly consisted of one fruit, protein, some healthy fat and fiber. Because of my crazy sweet tooth, I stuck to sweet potato or butternut squash smoothie at night with cacao powder and topped with nuts and dark chocolate to make it seem like I was eating dessert. The first week was more of a learning curve. It felt like I needed to add more substance to my diet but I couldn’t figure out how without snacking non-stop. 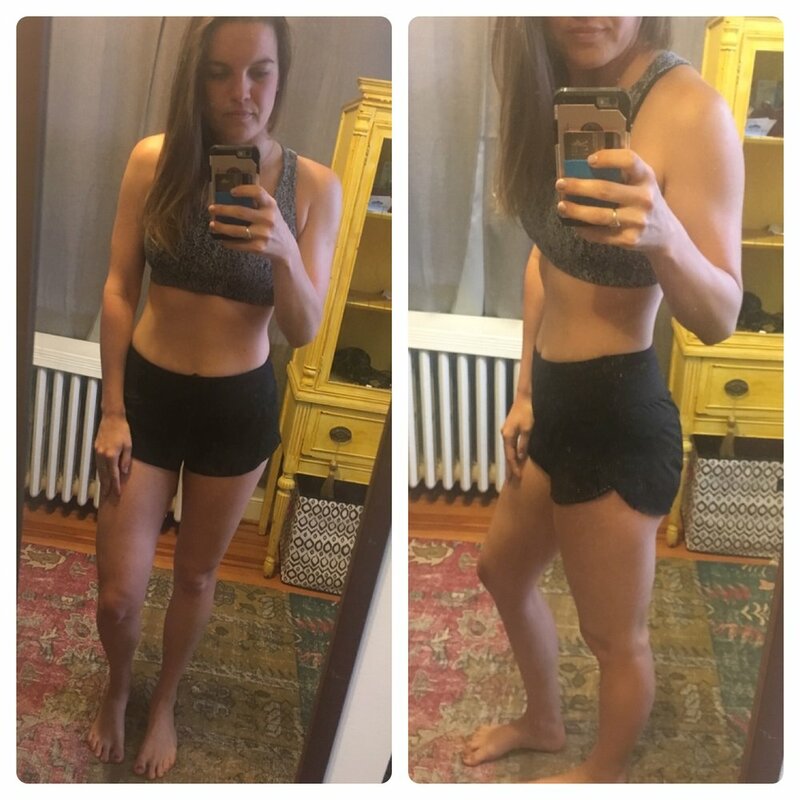 I didn’t snack the entire first week because I wanted to follow the suggestion of the program to try and leave a long period of time between each meal to encourage better digestion. One thing was for certain though, I had NO BLOAT, NO CRAMPING and felt the best I’ve felt in a while as far as my stomach goes. Week 2: In my experience, week 2 was BY FAR the toughest. I had to get over the fact that my weekend plans revolved around my evening smoothie and that people would inquire as to why I wasn’t eating out with everyone else. I also had really low energy the first day or two of the second week because I was still working out a few times a week and hadn’t backed off my consistent workout plan. I started getting really tired of eating the same smoothies so I started packing my smoothies with new fruits, new veggies and some herbs that helped me get creative. I also disliked the fact that the only full meal you can have is during the day which meant I had to really prepare for the week because I have a full-time job and couldn’t be at home to cook a big, fancy, meal. Week 3: A WHOLE NEW PERSON. Wow, this week was my favorite because my body started really turning a corner. I no longer was craving caffeine, I started recognizing foods that were causing bloat and had all my energy back. The smoothies weren’t so bad anymore and I felt like I was in a good routine. The great thing about this program is that because you’ve removed so many toxic foods, you can really pinpoint when a certain food triggers digestive issues. This was the week that I was really able to connect the dots between three different foods that were causing some major stomach pains. I also noticed my skin completely clearing up for the first time in years... such a beauty! Week three was my prime for sure. WOW. First, I’m in shock I survived 21 days without coffee, because let’s be real… is that even possible?! YES IT IS. Second, I did it! I’m so proud of myself for sticking to something, even when I had doubts and second guessed my decision. Third, IT ACTUALLY HELPED! I was able to get rid of so many toxins and food groups that were causing major stomach inflammation without even know it. I feel like I've turned a corner and can't imagine going back to the way I was eating. Even though I was eating SUPER healthy already, I had no idea what food groups were effecting my energy levels, stomach bloat and cramping. This program opened my eyes to foods that were healthy but still were hard for my stomach to digest. I will definitely be using this program every year to reassess how my body is reacting to foods. I’m taking my time implementing foods back into my diet to use this tool as an opportunity to find out really how my stomach is reacting to what I’m eating. I've been keeping a food journal and will continue to as I introduce foods back into my diet. The foods I missed the most were bananas, coffee and eggs... these will be the first that I reintroduce. From there, I should be able to pinpoint where my problem areas are and use this for my diet as I move forward being more aware of what foods I need to stay away from or just eat in moderation. I for sure plan to stick the Clean Program ingredient list as much as possible because I’ve never felt this great before! REMINDER: This is not about the number on the scale but about how I FEEL! As you can see, I lost a lot of bloat throughout the Clean Program. For me, these 21 days weren't about weight, but instead about how I felt. I truly feel like a different person because of the bloat and pain I was having on a daily basis. My clothes fit better, I have better energy and more importantly, I feel like I am myself again.